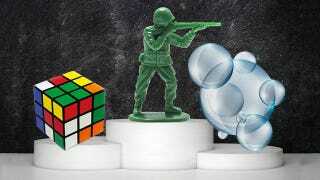 2014 Toy Hall of Famers Include Rubik's Cube, Army Men, and Bubbles? Joining the esteemed ranks of such cultural icons as "stick" and "cardboard box," three new beloved toys have taken their place in the National Toy Hall of Fame. Say hello to your new champions: Rubik's Cube, little green army man, and... bubbles. Over the years, these toys have remained popular because they are lightweight, simple to transport in buckets or pails, fun to blow up, easy to replace. But most of all because they inspire open-ended play.